Hortus Camdenensis | Romulea rosea (L.) Eck. Cormous perennial with 3-6 narrow basal leaves, grooved and very tough, and pink or white flowers with a yellow throat. Leaves to 15cm, flowers much shorter. [Hortus]. ‘Our drawing was taken from the rich collection at George Hibbert’s, Esq. Clapham, who received it by his collector from the Cape; it flowered also this year at Mr. CoIville’s, who had it from Holland, under the name of an Amaryllis. 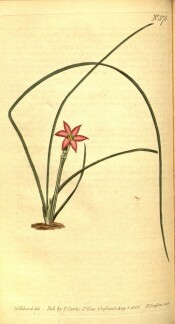 Found by Thunberg in various parts around Cape-Town, flowering in our summer months.’ [BM t.575/1802]. ‘Said to have been cultivated here in 1758. It is a minute bulbous plant, producing its pretty flowers in the months of May and June.’ [LBC no.1370/1829]. Received per ‘Sovereign’ February 1831 as Ixia rosea. [MP A2948]. Naturalised around Camden, particularly prevalent on road sides, parks and recreation fields. Found in large numbers at Camden Park, particularly on the Blarney bank. Interestingly it is not listed in any of the published catalogues. The bulbs are a favourite food of the local cockatoos.